They come from the legendary bands of Peruvian Cumbia and, after 40 years, they meet again to play finally together the music they participated in creating ! This musical wave was a phenomenon that could only take place during the sixties in Peru. 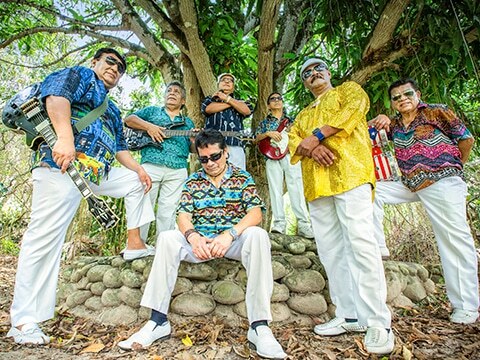 A product of the effervescent environment of a decade of rediscovered freedoms, it takes roots in remote cities of Amazonia, and among children of immigrants who gave birth to a musical genre that is now an integral part of the Peruvian identity: Cumbia Huaracha, Amazonian Cumbia or simply Cumbia Peruana. The Cumbia All Stars are among the creators of Peruvian Cumbia and they interpret, during their concerts, the most emblematic songs and the forgotten treasures of the repertory. Back to Lima in August, they start to work on the preparation of their first album, which will be released in January 2014 in Peru. In the meantime, they are invited by the Womex 13 Official Showcase Selection to represent the best of Peruvian Cumbia in Cardiff in October and announce their second European tour in less than 4 months!